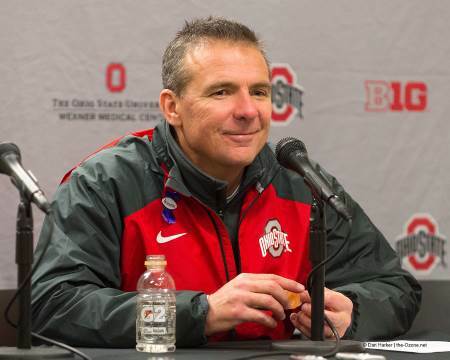 Urban Meyer at Ohio StateOhio State University head football coach Urban Meyer is 61-6 through his first five seasons leading one of the most storied programs in college football. He has coached the Buckeyes to a national championship in 2014 — the program’s eighth — by winning the first College Football Playoff (CFP), to a repeat appearance in the CFP in 2017, to five consecutive Big Ten conference divisional titles and a Big Ten crown in 2014, to a 38-2 record in Big Ten games and to a 16-4 record versus ranked teams. He has done this by developing and overseeing a program culture that requires accountability, promotes respect, prepares young men for life after football and develops football skill sets and talents at an unsurpassed rate: his program has produced 26 NFL draft picks the last four years, including seven first-round picks and record numbers of draft picks through the second, third and fourth rounds of the 2016 NFL Draft. And his team members are getting it done in the classroom, as well. Ohio State Buckeyes have earned four academic All-American honorees the past three years, one National Football Foundation Scholar-Athlete award and the team is coming off its finest academic semester under Meyer last fall with record numbers of students with 3.0 (or above) grade point averages for the semester and cumulatively. And 11 days later in the CFP national championship game at Reliant Stadium in Arlington, Texas, the Ohio State defense was again dominant and Elliott led an offensive charge with 246 rushing yards and four touchdowns in a 42-20 victory. Five years in as head coach of the Buckeyes and Meyer’s teams are 61-6 and with a plethora of superlatives, but winning games and competing for championships aren’t the only goals for the Buckeyes. Meyer wants more than just a degree for his students. He wants to also develop outstanding young men prepared to succeed in life, and the efforts he and his staff engage their student-athletes in to ensure they are prepared for life after football are equally important and impressive. As winter turns to spring and then eases into early summer, the Ohio State players continue to develop their minds and portfolios for life after football. Everyone gets a professional, leather binder and prepares or updates their resumes. The month of May is an opportunity for internships, site visits and shadowing opportunities for juniors and seniors. For example: Sam Hubbard, Joe Burrow and Austin Mack interned for a week at Goldman Sachs in May of 2016. The football program’s annual Job Fair takes place in late May. More than 50 companies across all sectors, including hospitality, law enforcement, broadcasting, medical sales, athletic administration, finance and business, send human resource representatives to meet with and ask questions of the Buckeye student-athletes. Contacts are made. Relationships are built. Life after football is in motion. Meyer, who is in his 31st season as a collegiate coach, is married to the former Shelley Mather. The couple are proud parents to daughters Nicki (a 2013 graduate of Georgia Tech) and GiGi (a 2015 graduate of Florida Gulf Coast), and a son, Nate (a high school sophomore). Nicki and her husband, Ohio State graduate assistant Corey Dennis, are the parents to the Meyer’s first grandson, Troy, who was born on CFP selection Sunday last November. Urban Meyer’s teams are 26-3 in “rivalry games.” Bowling Green was 1-1 vs. Toledo; Utah was 4-0 vs. Utah State and BYU; Florida was 16-2 vs. Florida State, Tennessee and Georgia; and Ohio State is 5-0 vs. Michigan. His teams are 99-20 in conference play with five championships (two apiece at Utah and Florida and 2014 at Ohio State). They are also 3-2 in conference title games. His teams are 10-3 in bowl games, including 2-1 in College Football Playoff games, 3-1 in New Years Six games and 4-1 in BCS bowl games. Meyer has coached teams to six double digit winning streaks: 11 games (Bowling Green), 20 games (16 at Utah and four at Florida), 11 games (Florida), 22 games (Florida), 25 games (Florida and Ohio State) and 23 games (Ohio State). His teams have 27 wins by 40-or-more points and another 24 wins by at least 30 points. Meyer’s teams are 3-2 vs. the No. 1 team in the nation, 11-4 vs. Top 5 teams, 20-8 vs. Top 10 teams and 37-14 vs. Top 25 teams. His teams are 45-4 when having more than one week to prepare for an opponent (includes season openers, games after “off” weeks and post-season games). In first-time matchups vs. an opposing coach, Meyer’s teams are 94-15. Meyer’s Buckeye teams have set and/or tied 34 team records — includes Ohio State, NCAA and Big Ten — including NCAA wins in a season (14 in 2014), Big Ten rushing yards in a season (4,321 yards in 2013, but that has since been broken) and total offensive yards (7,674), school overall winning streak (24), road winning streak (22), and Big Ten (30) winning streaks. Both the Sporting News and Sports Illustrated named Meyer “Coach of the Decade” in December 2009. Meyer has watched as a total of 62 players he coached the previous season get selected in the NFL Draft, including 16 first-round draft picks. At the 2016 NFL Draft, five of Meyer’s players were drafted in the first round, tying the mark for the second-most first-round picks in one draft. The first-round picks were Joey Bosa (No. 3 to San Diego), Ezekiel Elliott (No. 4 to Dallas), Eli Apple (No. 10 to the New York Giants), Taylor Decker (No. 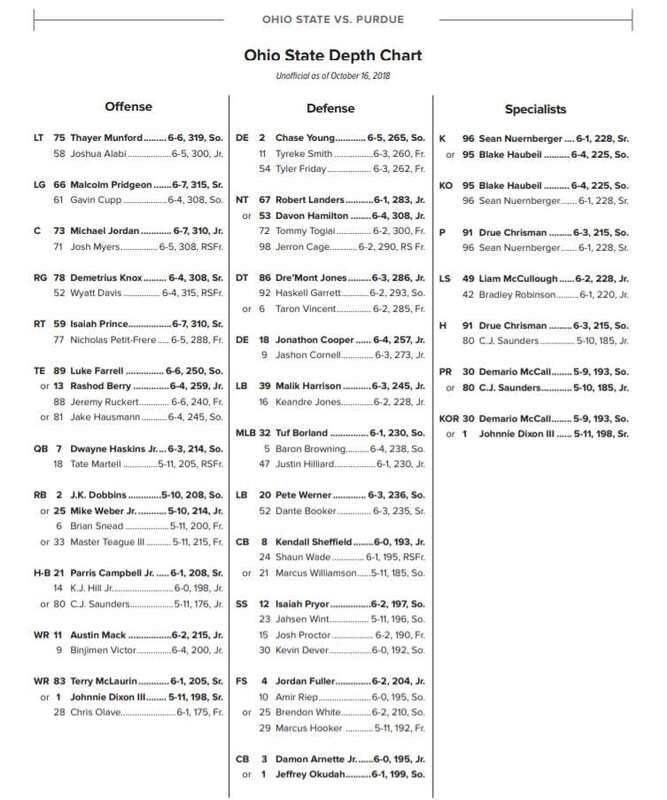 16 to Detroit) and Darron Lee (No. 20 to the New York Jets). A total of 12 Buckeyes were selected in the 2016 NFL Draft, with the total tying the NFL Draft record for most picks in the first two rounds (seven) and setting draft records for most picks through three rounds (10) and four rounds (12). Of Meyer’s 62 NFL Draft picks, four were quarterbacks, including first-round picks for Utah’s Alex Smith (San Francisco, 2005) and Florida’s Tim Tebow (Denver, 2010) with Smith the overall No. 1 pick. Smith and Tebow rank first and third, respectively, in the NCAA record books for passing efficiency; Smith in the 325-399 completions category and Tebow in the 500-or-more completion category. Between 2006-10, Meyer and Florida had more first round NFL Draft picks — eight — than any other school. Meyer’s first-round draft picks include UF offensive linemen Maurkice Pouncey (Pittsburgh, 2010) and Mike Pouncey (Miami, 2011); UF defensive linemen Jarvis Moss (Denver, 2007) and Derrick Harvey (Jacksonville, 2008); UF defensive backs Reggie Nelson (Jacksonville, 2007) and Joe Haden (Cleveland, 2010); UF wide receiver/running back Percy Harvin (Minnesota, 2009); Ohio State linebacker Ryan Shazier (Pittsburgh, 2014); and Ohio State cornerback Bradley Roby (Denver, 2014). Eleven (11) of Meyer’s former assistant coaches are FBS head coaches: Steve Addazio (Boston College); Gary Andersen (Oregon State); Chris Ash (Rutgers); D.J. Durkin (Maryland); Luke Fickell (Cincinnati); Tom Herman (Texas); John “Doc Holliday (Marshall); Dan Mullen (Mississippi State), Charlie Strong (South Florida); Kyle Whittingham (Utah); and Everett Withers (Texas State). @Fiesta Bowl at Scottsdale, Ariz.
*at Jacksonville; @Outback Bowl at Tampa, Fla.
* at Jacksonville, Fla.; # SEC Championship game at Atlanta; @ BCS National Championship at Scottsdale, Ariz.
*at Jacksonville, Fla.; @Capital One Bowl at Orlando, Fla.
*at Jacksonville, Fla.; #SEC championship game at Atlanta; @BCS National Championship game at Miami, Fla.
*at Jacksonville, Fla.; @Outback Bowl at Tampa, Fla.
#Big Ten championship game at Indianapolis; @Discover Orange Bowl at Miami, Fla.
@ BattleFrog Fiesta Bowl in Glendale, Ariz.
@ At CFP Semifinal/PlayStation Fiesta Bowl in Glendale, Ariz.